in North America are Red List Free, with third-party verification. That sounds impressive. But manufacturers make impressive-sounding claims all the time. Let’s start with a thoroughly uncontroversial statement: In today’s marketplace, sustainability issues are a key consideration in most purchasing decisions. Health and wellness concerns are also getting much more attention, because of the large amount of money companies spend on people (salaries and benefits). Based on the WELL Building Standard, on average that number is 90% of total operating costs. An office filled with healthy, happy people will obviously be a more pleasant workplace — but also a more productive one. Choosing products that have a positive impact on the environment as well as the health and well-being of people who live and work in our buildings yields a myriad of benefits, both economic and social. Being Red List Free means a product is certified to contain not a single one of the chemicals on a long list of very nasty stuff. Milliken has taken this one step further and third-party verified our entire line of North American-manufactured modular carpet tile product as Red List Free. While product transparency can be a complex topic, it doesn’t have to be hard to understand. So, join us as we take you through our own product transparency journey and dissect, demystify, and ultimately thoroughly explain the world that is product transparency. An overview of Declare and Red List Free. We realize that the topic of product transparency can be confusing and at times a bit technical. With that in mind we’ve tried to break this topic up into digestible pieces and get technical only where it’s needed. We’ll start off with a general overview but it’s important that we make a few key distinctions because as you’re about to find out, not all Declare products are the same. There are two main product transparency protocols administered by the International Living Future Institute (ILFI): Declare, and the Red List. ILFI calls Declare “a transparency platform and product database.” To create a Declare Label, manufacturers are required to disclose the entirety of a product’s constituent chemicals to a 100-parts-per-million threshold. The Declare label acts as a “product nutrition label” allowing the specifier and consumer to understand exactly what’s in a product. Once the Declare label is created, the list of chemicals is compared against a list of worst-in-class materials prevalent in the building industry – the Red List. Products declared “Red List Free” are precisely that: They have been registered and approved in the ILFI Declare Database as containing no chemicals from the Red List. Declared means you disclosed a products’ ingredients to 100-parts-per-million but your product has red list chemicals in it. In the spirit of product transparency, the good news is the ingredients of the products have been transparently disclosed. Some chemicals are registered proprietarily with the EPA meaning there is no public information available. This is where the LBC-Compliant Declare label comes into play. LBC-Compliant deals with the reality that it’s difficult to capture complete ingredient disclosures from some component suppliers. In these instances, ILFI will approve the product’s Declare Label, and grant the manufacturer an exception to withhold specifics about one or more component ingredients. The most common is the Proprietary Ingredients exception - if a manufacturer claims this, they have to get a letter from the supplier stating that no Red List chemicals are present. Other exceptions are allowed for specific Red List chemicals (e.g. some building codes require PVC for certain products so a product can get LBC Compliant with PVC in it, but only in very limited circumstances). 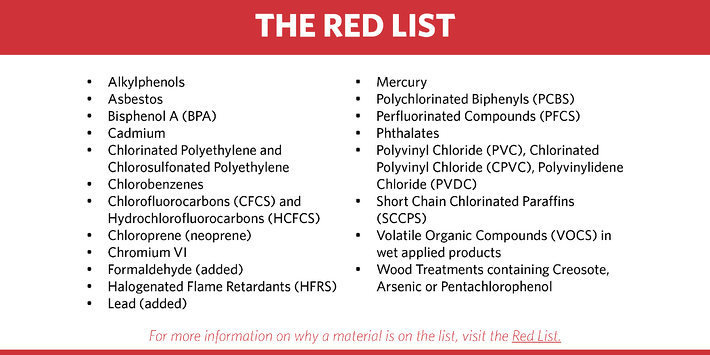 Red List Free means you’ve disclosed a product’s constituent chemicals to a 100-parts-per-million threshold and the resulting chemicals contain NO Red List chemicals. While this might sound straightforward the fact is, sometimes it can be difficult to get accurate disclosure information about ingredients from your component suppliers. In Milliken’s case, we were faced with: Thousands of products containing even more thousands of individual chemicals — coming from a very large number of different suppliers. All of whom have their own unique policies, quirks, and business culture regarding disclosure. Some may not want to disclose at all. In fact, 80% of the suppliers we initially reached out to wouldn’t disclose to the 100-parts-per-million threshold. Why not? Sometimes information is withheld for proprietary reasons. 100-parts-per-million is getting down to a very granular level and at that level many suppliers feel like they might inadvertently disclose trades secrets or other proprietary information. Also, a lot of this depends on what their suppliers disclose to them. In some cases, we worked with our suppliers to get additional information. In fact, we had an eye-opening moment as we began to work more closely with one of our yarn suppliers. As they looked into the chemical makeup of their entire supply chain it was discovered that disclosing down to 100-parts-per-million meant that the spin lubricants used to allow the yarns to be placed on spindles must be disclosed. This yarn manufacturer was having trouble getting this information from the manufacturer of the spin lubricant. Here’s the eye-opening part - as it turns out, the spin lubricant manufacturer was Milliken Chemical, a division of Milliken and Company our very own parent company! We were able to work with Milliken Chemical to get the proper disclosures but it was a very good example of how complex and messy this process can be. But this approach didn’t work for every supplier. For our first Declare labels, we were unable to get disclosures down to the appropriate levels from all our suppliers and we ended up with an LBC-Compliant Declare label. This wasn’t bad it just wasn’t to the level of transparency we wanted to get to. This is what ultimately drove us to look further into third party verification. 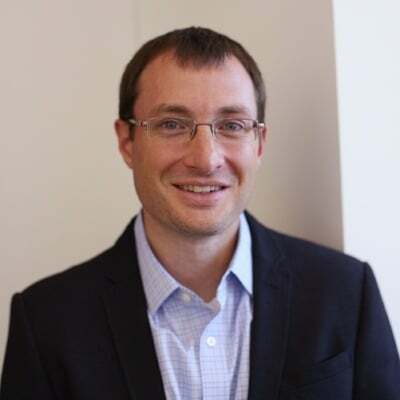 Third Party Verified, Red List Free is a third-party verification system that allows proprietary information to be disclosed only to a third-party consultant. From there it can be approved by ILFI. Suppliers are not required to disclose anything sensitive or proprietary to us (or any manufacturer) — they don’t have to worry about competitors somehow getting hold of the information. Achieving a Red List Free Declare Label may not require third-party verification, but it’s the only way to get to the level of disclosure and transparency that enabled Milliken to receive Red List Free certification for our entire product line of modular carpet. So, with this in mind you might find yourself asking, how can a manufacturer ever get a Red List Free label without third-party-verification? That’s the topic we will tackle next. Why third-party-verification and what’s next? The reality is, many times, a manufacturer doesn’t know, what it doesn’t know. While that may sound cliché it really is the case here. 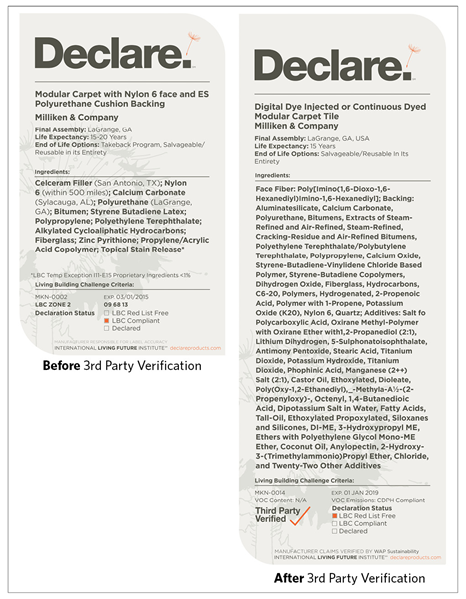 Below are two of Milliken’s own Declare labels: one showing the list of ingredients before third-party-verification and the other, the list of ingredients after third-party- verification. It’s easy to see that there is a dramatic difference. So how are these both Declare labels of the same product? Well, it’s simple, third-party- verification got us to a more granular level, especially when dealing with suppliers of our suppliers. Look at third-party-certification as an evolution of the Red List Free Declare label. Back to the question - how can a manufacturer ever get a Red List Free label without third-party-verification? This is where the gray area comes in to play. A manufacturer may reach out to a supplier and receive back a list of chemicals and not realize that certain components were omitted. This isn’t necessarily intentional, remember this is a very complex and frankly difficult task we are asking of our suppliers. Nonetheless, this “incomplete” information is then gathered and submitted to IFLI for review and can be approved, again not realizing everything wasn’t disclosed. In fact, after we initiated third-party-verification we were surprised to find out that there were some obvious omissions on our initial Declare Label. Anything that’s black has carbon black in it, anything that’s white has titanium dioxide in it. It’s safe to reason that these chemicals should appear on all Declare labels but they didn’t appear on our initial Declare Label. Most (if not all) commercial nylon modular carpet tiles use fillers. These fillers are used in carpet backing to reduce overall cost, enhance durability, and improve manufacturing efficiencies. Most fillers are limestone based which is comprised of calcium carbonate and silica/quartz above the 100 parts per million threshold meaning these chemicals should be listed on a Declare Label. If you look back at our original label we listed Calcium Carbonate but not Silica. Again, nothing intentional, just incomplete information. With this in mind, you can now see how companies can, with good intentions, submit a Declare Label disclosing the ingredients to the 100 parts-per-million threshold and still miss some ingredients. These moments were eye-opening for us as a manufacturer and shortly thereafter, Milliken began a far-reaching move toward full transparency: We would identify with certainty every component ingredient in every carpet product we make, and then we would use that data to move toward Red List Free status — for our entire catalog. Ultimately, this was a two-year process, culminating in the announcement of January 1, 2018.
defining standards? Which benchmarks will be the primary drivers of the market? Milliken believes the current focus on transparency signifies the beginning of a fundamental shift in sustainability thought: Less emphasis on specific issues (e.g. recycled content, take back) and a move toward a more holistic approach to the circular economy. The increased visibility of platforms like Declare, or the rise of scoring systems such as Google Portico seems a clear indicator. All of which dovetails perfectly with our own long-held belief about approaching sustainability from a holistic perspective. healthy building materials will, before long, simply be considered standards. Transparency — in contrast to narrow-focus concerns like end-of-life — doesn’t miss the forest for the trees. It provides directly observable data about building materials (and their potential effects) relevant to the people who live with those materials on a daily basis. This includes considering toxic legacy chemicals being reintroduced into the manufacturing process from cradle-to-cradle practices where older carpet tiles are recycled and used as raw materials in new products. It’s all part of a comprehensive, human-centric way of thinking. Most of what we’ve been doing for the past two years has been about acquiring a precise understanding of what’s in our products. From that knowledge, Milliken has already re-engineered and replaced some chemical components for a portion of our product line. This work was an integral part of the process allowing us to reach our catalog-wide, Red List Free goals announced on January 1, 2018. The announcement signifies another important step in our ongoing optimization process — something Milliken has long prioritized. Making only PVC-free modular carpet, for example, was an optimization decision. In recent years, that decision has taken on added significance. Why? Because PVC is on the Red List. Therefore, companies who choose to draw the line at Red-Listed chemicals must necessarily stay away from floor coverings containing PVC — which includes many hardback modular carpet products. This is a perfect example of why putting an emphasis on product optimization can often lead to positive outcomes. Our ultimate goal is to optimize the ingredients and chemistry of ALL our floor covering offerings worldwide. Not simply based on Red List concerns, but to continue to increase the positive effects and performance of Milliken products on the people who make them, use them, and on the larger environment we all live within. We consider this a challenge. To ourselves, first and foremost. But also to our competitors — and to the architects, designers, specifiers, and executives who are making the decisions about which products are specified, purchased and installed. Think of it this way: The people who live and work in our buildings just get what they get. of course. But, when it comes to picking the office environments in which they work? They’re essentially passive participants in their own work spaces. You, however — designers and specifiers, facilities managers and purchasing executives — are an active participant. You decide what materials get installed in these work spaces. You make the choice. And — the more you know, the better your choice will be.